It's a real pleasure to receive an invitation to lecture on my M.A. thesis topic--Berlin work--five years after I finished that degree and three years after publishing an article based on that research. 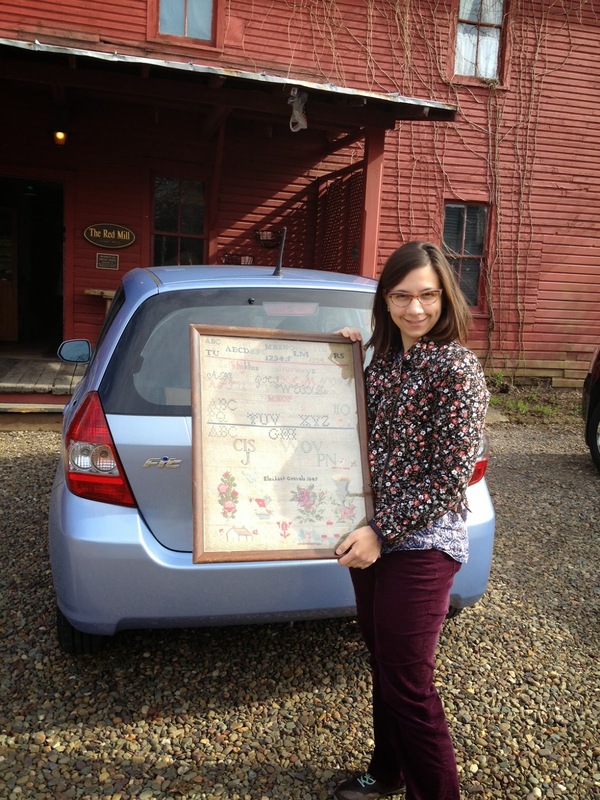 I must admit that I had that Spring 2015 lecture in mind upon purchasing Elizabeth Gotvals's 1847 sampler at my favorite antique shop near in Pennsylvania last weekend. Wow, an identified and dated piece of Berlin work, made when Americans had only begun to embrace the needlework made using soft woolen threads and patterns printed in women's magazines and sold by the piece in fancy shops. I'm not sure if the backing is lignin-free and acid-free, so I'll probably carefully switch it out with something I can confirm is inert and therefore less likely to speed the sampler's inevitable deterioration. That said, it's in pretty good condition. I am simply thrilled to add this to my collection. But, frankly, it's always a good day when I have an opportunity to stock up on Berlin work specimens I can trot out for my lecture audiences (not to mention my students). Nothing beats learning from the objects themselves. 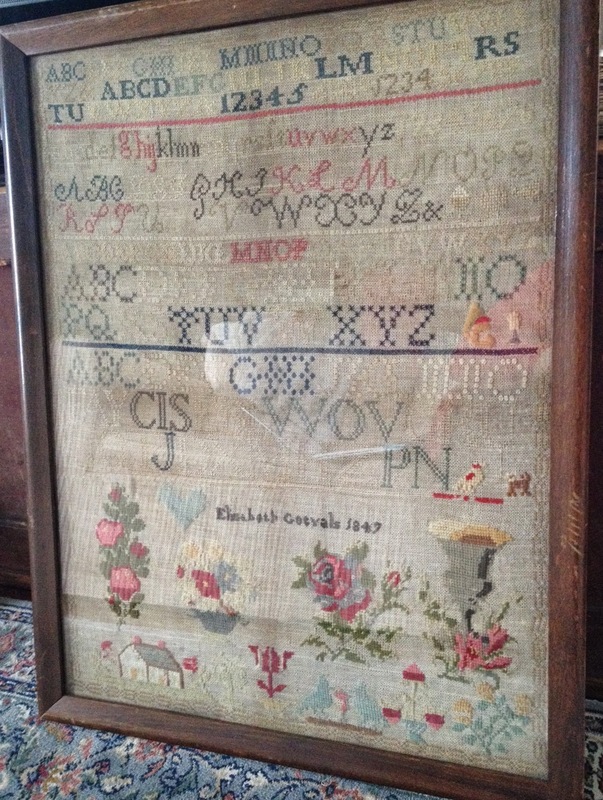 Elizabeth's work includes a traditional "sampler" design at the top featuring the alphabet and numerals in silk on plain-woven cotton canvas. The bottom portion features Berlin work designs (mostly floral) in wool. As I have explained before, needlework collectors tend to shy away from this stuff for a few reasons. Many people think it's 1) unoriginal and 2) gaudy. The wool's colors are too bright and therefore tasteless, some think. Critics also believe that the Berlin needlework designs, wrought using widely disseminated patterns as guides, embodies a lack or imagination on the part of the needleworkers. I'll leave it up to you do decide for yourself how you feel about it. In the mean time, I'll keep collecting it and lecturing about it. For more about Berlin Work, see my article in Winterthur Portfolio: "'The Blood of Murdered Time': Ann Warder's Berlin Wool Work 1840-1865," Winterthur Portfolio 45, 4 (Winter 2011): 321-352. I have also written about Berlin work on this blog before. Check out this post, "Berlin work: craft, kitsch, and fashion." In my region, some of my favorite Berlin work can be found at the Winterthur Museum and the Schwenkfelder Library and Heritage Center. Copyright © 2015 Nicole Belolan: nbelolan at udel dot edu and nicolebelolan.org. Simple theme. Powered by Blogger.